Alcohol dehydrogenase (ADH) is an enzyme that makes it possible for humans to drink beer, wine, and other alcoholic beverages. However, its "real" function is thought to be the conversion of alcohol generated by bacteria in the intestine to other metabolic products. Individuals with some mutant forms of ADH may be especially sensitve to alcohol. The molecule is a dimer made either of two identical or two different chains. Three of the possible sequences, alpha, beta, and gamma, are represented in the music; their slightly different sequences are listed below. The beta sequence has regions of alpha helix, beta strands and turns marked; the alpha and gamma sequences have been aligned to make comparison of the three sequences easy. 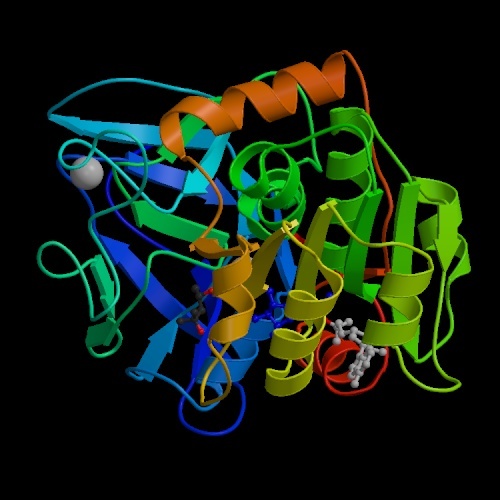 The many beta strands in the protein combine to form a beta-barrel -- a suitable form for an enzyme of this type! The ADH gene itself seems to have been duplicated twice in humans; three ADH genes are closely associated on the same chromosome. This sequence, like the sequence for Calmodulin, produces a musical line with a natural dance rhythm -- this time a tune with triplet rhythm like an Irish jig. Percussive beats throughout the piece accentuate this triplet rhythm. The sequence is played completely through three times. The first two times, different instruments -- various flutes, reed instruments and plucked strings -- take up the tune in turn, playing first the beta, the alpha and gamma sequences, and finally all three together. Occasional differences between sequences can be heard as chords within overall unison. The third time, the tune is played in one voice, while three others represent the alpha, beta and turn segments of the protein. The sequence then plays through a final time, ending with a single voice and drumbeats.